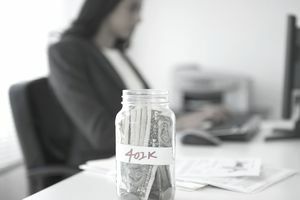 You don't have to be concerned about your 401(k) vesting schedule(k) when you make a contribution to your 401(k) plan. You won't forfeit your own contributions if you terminate your employment, either voluntarily or involuntarily. But the same isn't true when it comes to your employer's matching contributions. Your right to these contributions often depends on staying with your employer for a prescribed period of time. This period of time can vary by company, although it's subject to some federal rules. Understanding the vesting schedule and rules at your company can reduce or even eliminate the possibility of forfeiting your employer matching contributions. Vesting means that you've earned the right to keep your employer's matching contributions to your retirement plan. Vesting in a retirement plan refers to owning the funds in that plan. You have a legal right to keep the contributions when you vest in your employer’s matching contributions. You've reached the point in time when you can leave or be fired by your company but retain that money. Employees are always 100 percent vested in their own salary-deferral contributions to a retirement plan. The same concept applies with SEP and SIMPLE contributions made by an employer. Approximately half of all companies offer immediate vesting for matching contributions. An employee who is immediately vested in her account balance owns 100 percent of it from the time employer contributions are made. The employer can't take it back for any reason. You can make a contribution today, and even if you leave your employer tomorrow, you'll be 100 percent vested in your contributions and your employer's match. Your employer contributions might also be 100 percent vested if your company uses a “safe harbor match.” You'd be 100 percent vested in that part of the company's contribution. Other circumstances can demand that you become 100 percent vested immediately as well. The money is all yours by law if the plan terminates, or when you reach the plan's retirement age. Although some employers do offer immediate vesting of their matching contributions, it's just as common that their rules force employees to vest according to a predetermined schedule. This prevents employees from quitting on Friday, taking with them the matching contribution money the company paid on Thursday. There are two basic kinds of vesting schedules: graded vesting and cliff vesting. Companies are legally permitted to wait two to six years to fully vest an employee using this schedule. A cliff vesting schedule is much like it sounds—you won’t be vested at all for a period of time, then, like going off a cliff, you'll become vested all at once. This usually occurs after one to three years of employment. Vesting of 100 percent is required after three completed years of employment. Any employer can use either a cliff vesting schedule or a graded vesting schedule, but not both. Make sure you're aware of your employer’s vesting schedule before making any major career decisions. Saving for retirement is important, so you won't want to voluntarily leave your job just before you're about to vest in a significant sum of employer matching contributions. Of course, there are always exceptions, such as that a far superior job offer is on the immediate horizon, making it more likely that you'll be better off in the long run.